that sound – the thud of a bird hitting our plate glass window at high speed. We rush over and hope this one has not been knocked unconscious, or worse, had his neck broken. It’s estimated that over a billion birds each year are killed by hitting glass windows on all kinds of buildings from skyscrapers to private residences. But many of these deaths and injuries can be avoided by making the glass in our homes more bird-friendly. Typically birds hit windows is they see a reflection in the glass of sky and/or trees, or see plants or trees behind the glass. Not being educated in the properties of glass, they believe they can either fly through what appears to be open sky or land into the trees in the reflection. Either of these assumptions can result in a one-shot lesson on glass, and fatal injury to the bird. The key for safe windows – whether in your home or office – is giving birds visual cues that let them know this is not open space. If there is nothing interrupting the image they see, then the bird may see the window as open space and fly directly at it at high speed expecting to either fly straight through or land on a branch that is reflected in or seen behind the glass. The key is to interrupt the visual image so that the bird recognizes this is not open space. This may require either reducing reflectivity or placing a pattern on the glass which shows any open spaces are smaller than the wingspan of a songbird. able to place the screen 2-3″ from the window on a frame, even if the bird hits the screen at full force, he will bounce off. Another easy to install solution (pictured here) are Acopian BirdSavers. 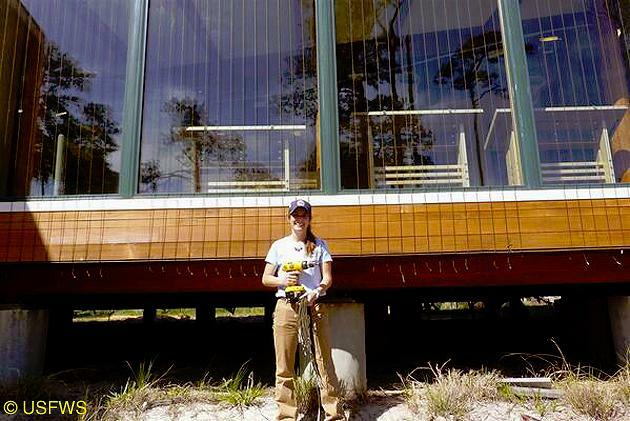 Many of the newest and most interesting solutions involve putting a pattern on the glass with sheets or strips of patterned film, like UV film you may already have on your windows to keep the sun from fading things inside. These patterns are nearly imperceptible to humans, but send exactly the right visual cues to birds that this is a solid object and not open space to fly through. 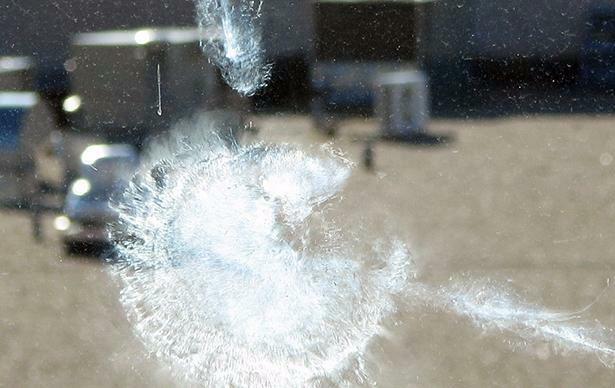 These are easy DIY projects that may make the difference for birds between safety and a fatal run-in with your windows. FLAP of Canada (Fatal Light Awareness Program) has some really practical information regarding solutions.